I'd like to accept this award for all the cats who are still looking for their forever homes. Tonight the Grammy Awards are being handed out. Although I'm not up for any this year, I did receive a few awards recently. Can you believe TW doesn't appreciate my singing? The way she hollers at me, you'd think I was some Tom singing on the fence. For her info, I sing like Beyonce. So there. I'll start with the most recent award, which was presented to me by Abbi, Atere, Livia and their Mom Stephanie about a week ago. They write the entertaining The Musings of a Crazy Cat Lady. They presented me with the Reality Blog Award. Since I've already received the award several times, I'll let you read my answers here. They're worth reading. Next, I was presented with the 2013 version of the Liebster Award which is supposed to go to blogs with less than 200 followers hence the reason the awards says "discover new blogs" right on it. I'm lucky enough to have a few more than 200 followers of which I'm very proud. This honor comes via Spitty the Kitty of Spitty Speaks. Thank you, King Spitty. The makers of the award want to know 5 things about me so here goes. I'm stunning. I'm a stunning virtual DJ. I bite my humans. I like human toys better than cat toys. I like to be FURminated. The nosy buggers also have five questions for me. 1. What is your favorite thing to do? Play. All roads lead to my tunnel in the hall. I also like to eat. 2. What is your favorite time of year? December cos Pop is home most of the month I'm a cat so all the months run together. 3. What's the most important thing you want to do? Isn't that redundant to question #1. 4. Who is your favorite person or animal pal? Pop is my favorite person because without him I would have been sent back to the prison shelter a long time ago. Pop sticks up for me even though I bite him more than I bite TW. I have many anipal BFFs but I don't want to name my favorite for political reasons. I bonded with Herba from the Burba a long time ago and still value his love and furrendship. 5. Where in the whole wide world would you like to go? Where else? Into any closets or rooms where the door is shut. An alternate answer would be I'd like to go back to Communipaw and see what's become of the old hood and if it's been gentrified yet. I'd also like to go to Fort Knox so I can get enough gold to support my peeps. They're on a fixed income and it hurts to see them scrimp on buying stuff for the cat. 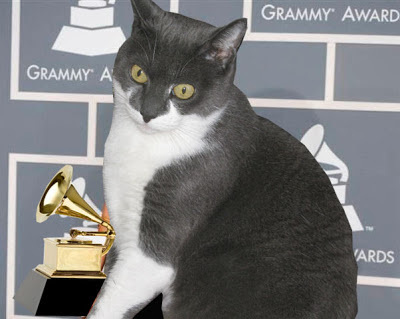 I also received the Lobster, er, Liebster Award from the Purrime Minsterettes of Planet Purrth Shiva and Jaya, who also awarded my with the Purrime Minsterette Pees on Purrth Award of which I'm very honored. They axed five additional questions which I'll try to answer as best I can. 1. What song makes the soundtrack of your life? I dunno. There are many songs. TW would say her soundtrack was Winter Hours' Island of Jewels. She reads a lot into the lyrics. But no one axed her. Mine is maybe something like Pink's Get This Pawty Started cos I'm all about pawtying. On the serious side, I'd have to go with a brilliant song by Lene Lovich and Nina Hagen called Don't Kill the Animals. The lyrics are brilliant and they're me. As a bonus, you can dance to it. 2. Who is your favorite politicat and why? That would have to be my PM bosses Shiva and Jaya. They're all about peace and ending animal abuse and abolishing the evil VC (vacuum cleaner). 3. What kind of anipal scares you the most? My teeth and claws are sharp. I have no fear. I do fear clueless humans that destroy the Earth and then deny stuff like Climate Change and Global Warming and even Science itself. They cut down trees and release toxins and poisons into the air, ground and water and then they blame cats for killing birds and wildlife. 4. If you could be human for one day, what would you teach Planet Purrth about love and friendship? I'd outlaw all guns and weapons and shoot anybody who still wants to own a gun. It's NOT their 2nd Amendment right. I'd also shoot anybody who hurts animals of any kind. 5. If you could travel to a far-away destination on Planet Purrth, where would it be and why? That's a toughie. I'd probably travel to see Shiva and Jaya at 10 Downing Street. They might knight me or something. Then I'd like to go on a Stunning Keisha World Tour so all my admirers could meet me. Kinda like Pip and Puddles only I wouldn't be sick. 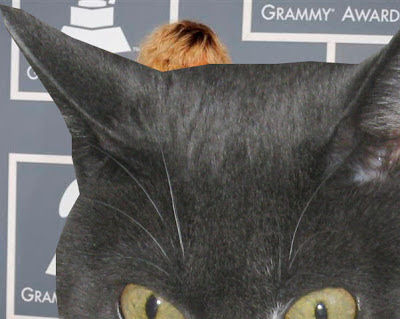 CK photobombing Rihanna at the Grammys before I accepted my award. Mes would LOVES do do a bucket tour with yous. Concatulations on your awards, CK! I loved ALL your answers! Congratulations on your awards Keisha. We think you should indeed go on a world tour and show the world how stunning you are. Have a super Sunday. COngrats on the nice award CK!!! Your answer list was way cool! Wow, that's a lot of awards, CK! Congrats on them all!! You are a kitty that meows your mind! You deserve all these awards and more, CK!!! You can come on over and sing with us any time...3 AM is best! Scare the pantz offa Mommy, heh heh. Congrats on all those awards, CK!!! I bet you have more awards than Rihanna has grammy's!!! ...I especially love where in the whole wide world you'd want to go. ; ) LET'S OPEN ALL THE DOORS!!! ConCatulations on those well deserved awards!! Concatulations CK. Great photobomb there! Could you stop by here on your World Tour? I'm a little a-skeered of you, but I do have some good toys that I'll be happy to share if you promise not to put the bitey on me toooooo hard. A little nip would be fine, though.